A lantern clock came to light recently, which was unsigned but clearly from the workshop of the Halifax Ogdens. This led me to look back at my earlier researches into the family. I was surprised to see that I had five massive folders full of documentation and photographs resulting from the last research I carried out into the Ogden family of clockmakers and I was even more surprised that it was over twenty years ago. It took a while to get back into the genealogy of them all, to get my mind back again into that time zone of forgotten research. I do recall that when, at that time, I uncovered bundles of late nineteenth-century Ogden family papers left by immensely wealthy descendants in Northumberland, their family background was so complicated and went so far back, that they had themselves lost track of their origins and hired a professional genealogist to look into the history of their family! Those later Ogdens in north-east England were descended from John Ogden of Bainbridge in Wensleydale and his brother, Samuel, of Benwell – both of whom of course came originally from the Halifax family. This genealogical research might have been helpful to me if I had found it before, rather than after, I had uncovered their genealogy the hard way. The Ogdens of Wensleydale eventually became extinct in the male line with the deaths of Henry Ogden in 1871 and John Maude Ogden in 1892. The Ogden family of clockmakers, who ultimately spread widely across northern England into the late nineteenth century, all descend from a single common ancestor, who lived at Soyland near Halifax in the first half of the seventeenth century. This was James Ogden (senior) of Water Green, Soyland, who was living there by 1665, possibly earlier. He was probably born in Lancashire in the 1640s, and when he moved to Soyland he seems to have brought with him his elderly father, another James Ogden, who died there in 1669. Soyland is on a hillside about three miles from Ripponden and was within the chapelry of Elland. 1. This unsigned clock is obviously from the Ogden workshops. The dial engraving, corners, frame, bellstrap and hand are typical of James Ogden. The chapter ring echoes that of Samuel Ogden. In his will James Ogden senior of Soyland described himself as a yeoman farmer. But by the time he made his will in 1730 he was close on ninety years old and no doubt long retired from his original trade of clockmaking and probably also blacksmithing. Most rural clockmaking families began as blacksmiths. He had twelve children, six sons and six daughters. The surviving sons all took up clockmaking and one of his daughters married a clockmaker. These clockmaking sons were: John Ogden, who was born in 1665 and moved to work at Bainbridge near Askrigg; Samuel, who was born in 1669 and worked at Ripponden till about 1712, when his wife died and he moved away to Benwell, near Newcastle; Isaac, who was born in 1689 and worked locally; James junior, who was born in 1689 and worked at Soyland till his early death in 1715. The other well-known local clockmaker was Thomas Ogden, who was born in 1693, the son of Samuel, but who stayed on to work locally after his father moved to Benwell. Perhaps he was apprenticed under his grandfather, James, which would have begun about 1707. James senior was not a Quaker in his earlier years but clearly took to that faith later in life, as did some of his sons in their maturity, that is after about 1685. The eldest son, John, took himself up into Wensleydale to work near Askrigg, where he married about 1700 into the Calvert family, who were prominent local Quakers. John himself became deeply involved in that faith, and legend has it that his reason for moving into the northern dales was to escape persecution at Ripponden. It may be that John was the first in the family to be drawn to the Quakers. His family in Ripponden do not seem to have taken to Quakerism till later. I think there was some serious rift in the family, particularly between John and his father, James. The eldest son would usually have stayed near to home to inherit his father's business – which he did not. And even in his father's last years, James made no mention of him in his will. John was conspicuous by his absence, while James did mention his other surviving children and grandchildren by name, even though he left some of them as little as a shilling each. A one-shilling bequest was merely a courtesy mention, just to show that the testator had them in his thoughts. But he made no mention of John or his wife and their several children, who were all still living at the time. That may imply a certain stubborn bitterness in an old man of about ninety and not far from meeting his maker. Perhaps he never forgave John for having moved away as he did. Yet John named his first son James, after his father – or was it perhaps after his Quaker brother-in-law, James Calvert? Only a handful of lantern clocks are known by the Ogdens and they were all made in the Soyland area. A single example is known by Samuel dating from the 1690s, now in the care of Halifax museums, made originally with a centre verge pendulum and signed 'Saml. Ogden Fecit'. Its dial engraving is unlike any other Ogden lantern clock, though its frame is similar and its arrowhead half-hour markers are very individualistic. A second lantern clock signed 'Samuel Ogden' is suspect. Samuel's clocks seem to have been mostly longcase examples. One is recorded signed 'Isaac Ogden Sowerby'. No details are known about that clock. 2. This detail shows the detail of the engraving and the crab-claw hand. The face, which resembles that on a penny-moon dial clock, fills the area where a signature might otherwise have been placed. James Ogden junior was born in 1689, the youngest son of James senior. Only one clock is known which can positively be ascribed to him from the several that are known signed by a James Ogden. 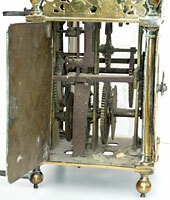 That is an eight-inch, square dial, thirty-hour, anchor escapement, single-handed clock which uses a lantern type movement but was clearly intended either as a longcase or a hooded clock. It is signed in a unique way 'James Ogden Clockmaker 1712'. The dial caries no engraved decoration – we know some Quakers shunned decoration and we know young James was a Quaker. James would have been 22 when he made this clock and newly out of his apprenticeship, which was presumably to his father. This method of signing says to me that he was newly qualified and was making what might be his first clock and that he was proud to announce to the world that he was now a qualified 'Clockmaker'. Young James married in 1713 but died tragically in 1715, aged only about twenty six. This means that James senior must be the one by whom a number of longcase and lantern clocks are known. In any event the lantern clocks are too early to have been made by James junior. What do we know about James Ogden's lantern clocks? A single lantern clock is known signed 'James Ogden'. James appears to have signed all his clocks without a placename, which was regular practice for clockmakers who worked in a remote location, the name of which might not be known twenty miles away. It dates from the 1680s and was made originally with a centre verge pendulum, like the one Samuel made later. The engraving is of a very strong and distinctive style with bold tulips deeply and heavily engraved in such a manner that it is instantly recognisable. The bellstrap is made of iron and clips around the finial tops rather than using the usual method that brass straps have of pinning into the finial top. The hand is very distinctive, its tip embracing the hour numerals by a pair of pincers reminiscent of crab claws. Another lantern clock of similar age is known with a very similar dial, frame, fret and chapter ring and that is unsigned but bears an engraved monogram on the fret 'J O'. That clock was also made with a verge pendulum originally but was converted later to anchor escapement and long pendulum. That must surely be James Ogden. Another lantern clock came to light recently, unsigned, but with James Ogden's distinctive dial centre, an iron clip-round bellstrap, a hand with the crab-claw pincers, and in the space where the name might appear – an enigmatic face, a bit like the face on an early penny moon dial. What the face means I have no idea but, in the absence of a signature, it fills up what would otherwise have been a blank space. The chapter ring has the very unusual arrowhead half-hour marker as used on Samuel's clock. The dial corners have the three-leaf motif common to all three of these clocks. This clock could only have come from James Ogden's workshop. It was made with anchor escapement, which might suggest it is a little later than the other two. 3. The movement of the unsigned clock has not been cleaned for many years. It was built with anchor escapement. It is very seldom we know anything of the history of these clocks but in this instance we do. The unsigned clock has been in the same family since about 1900. At that time it was given as a present to Mr. James Bateman, who lived at Milnthorpe, near Kendal, by an owner, in whose loft it had been lying unused for many years. It later passed down the family to Mr. Bateman's great granddaughter, till sold recently at auction. So we have three lantern clocks from James Ogden's workshop. Why would he sign one, monogram the next and leave the third unsigned? Well, one thought occurs to me. We know in his earlier life he was not a Quaker, yet later in life he was. Some Quakers thought it vanity to sign their work – though this never stopped most of the Halifax Ogden clockmakers from doing so. Maybe James took this view as his faith strengthened. Yet his longcase clocks are signed in the normal way, those we know that are signed by him. But, unlike his lantern clocks, his longcase clocks do not have a style unique to him, so that we could not identify any of them as being by him UNLESS they were signed. So maybe he made some longcase clocks which were also unsigned and we simply cannot recognise them as his. James Ogden made his will on the 23rd April 1730. He was at least eighty-five years old. He died on the 17th February 1734/35, aged about ninety. Wills sometimes tell you more by what they omit than by what they include. His sons were all dead except for John, who by now had moved from Wensleydale to live in Darlington and who was himself seventy years old. James left his household goods and ten pounds to his daughter, Sarah, a spinster aged fifty one, who probably kept house for him. She seems to be his only surviving daughter, though his son-in-law, James Hargreaves, was still alive, a woolcomber in Halifax and widower of James's late daughter, Mary. James Hargreaves was named as an executor together with James Ogden's grandson, clockmaker Thomas Ogden (son of his late son, Samuel of Benwell), and he left each of them five shillings. Other small bequests were left to his grandchildren, children of his late daughters Mary Cocker, Susanna Hargreaves and Martha Shepherd. Martha had married clockmaker Joseph Shepherd in 1696 and they had moved away to live in Sheffield, but had obviously kept in touch as James left a shilling to his grandson, Joseph Shepherd, then only one year old. So distance was no barrier to maintaining contact. But he made no mention of his son, John of Darlington, or John's five children, or John's many grandchildren – a large family group, almost thirty of them in all. To my mind this apparent rift adds a sad note to the Ogden family story. A father and son with no contact for fifty years? Perhaps John never spoke of his father. It seemed little wonder that the descendants of John Ogden, who became very numerous and extremely prosperous in all manner of business ventures and advantageous marriages, hired a professional genealogist to trace their ancestry, and on more than one occasion. But it seems this was for the purpose of claiming inheritances, as for instance when two brother of John Ogden's wife, Margaret Calvert, both died without issue. They traced the family back five generations to prove the link with these Calvert brothers, as far as Margaret Calvert, who married (blank) Ogden, as they described him. John's first name was forgotten or not considered important. They did not even bother to uncover John Ogden's first name, so no question of going back to Soyland. So it was not out of an interest in the family origins, but to claim land and monies. John's estate was valued in 1780 at £2,000, but twenty years later it was sold for between £3,000and £4,000. That must represent three or four million today. No one-shilling bequests amongst these descendants. I can't help but feel sorry for John – ostracised by his father and forgotten by his descendants. Could it be that James cut off his son, John, because he married into money? I doubt we will ever know.